I have learned so much from you, I feel so blessed to have met you. Thank you for your wisdom, your strong yet gentle masculine energy that feels protective and safe. I can’t begin to explain how different I feel today. Before you I was lost and confused, I did not know what was happening to me. Now, I’m a different person. My intuition is so strong. Sometimes it scares me. I’m still evolving and you made it possible. You are a great teacher. I can't believe how quickly I've progressed—it feels like light-years in only a short time. Supercharged! You might not have been raped or beaten—but many have been. You might not have been molested by your mother, father, brother, uncle, or aunt—but many have been. You might have had to succumb to the advances of a date, spouse, employer, professor, or police officer to avoid greater injury or worse consequences. Bottom line, you’ve had your heart ripped apart by someone you trusted when they didn’t stop and didn’t listen to your pleas to leave you alone. One of your fears is that if the monster comes back will wreak havoc on your life. The monster you're afraid of isn’t the perpetrator—you’ve seen to it that he (or she) can’t hurt you anymore. No, the monster is the force that shows up and sabotages your marriage, relationship, friendship, or job. This monster shuts you down, makes you lash out, and filters your perception so that everything falls apart and you feel helpless and alone. You’ve also become wary of getting too intimate, too deep where your emotional landmines get triggered and send you spiraling down a black whole of despair or acting out your rage, anger, and pain. Everything suffers. Your relationships aren’t as connected and intimate or fulfilling, your spouse or friends complain that you’re “distant” —or they don’t complain and just accept you at arm’s length because they don’t trust you can be a close friend. Maybe you’ve become everyone’s emotional dumping ground and people take advantage of you because you can’t say “no” and you fill up with all of their problems to the point of being overwhelmed and fragmented. Your life is like a soaked sponge that is always emotionally messy and leaking everywhere. So you compensate by living a life of half-measure where you’re not completely there—you’ve always got a wall up that keeps you safe. I’ve been there myself. I was abused by my father, and my mother—in different ways—but with the results mentioned above. Also, I've suffered through a bad marriage where I was physically, verbally and emotionally abused. After many agonizing years I got help through counseling therapy which was partially effective. It wasn’t until I had sessions with a sexual healer that I was able to understand myself deeply enough to release the emotions and patterns of belief that sabotaged my life. 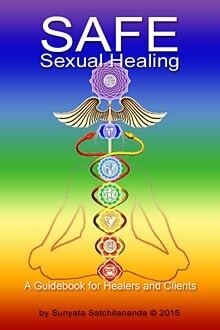 Sexual healing does what no other healing modality can, or will do. It meets your issues where they are located—embedded in your physical body while referring to memories, emotions, and patterns of belief associated with trauma. It wasn’t until I was able to unwind the knots of emotional wounding that I felt relief and a return to wholeness. Healing from sexual abuse doesn’t mean you forget what happened—it means what happened doesn’t rule you and sabotage your life. Going from fear to freedom is much easier and more effective when you have guidance and coaching that helps you sort out confusion, or with understanding deeper motives, or with feedback on hidden influences and beliefs. It is possible to live a happy and fulfilling life with deeply satisfying and intimate relationships without fearing they will “blow up” due to the monster getting loose and ruining everything. You can unwind the knots that block your creative and sexual energy. You can let your heart open and be vulnerable again. You can “show up” completely in your relationships and not fear losing them. There is hope. There’s a lot you can do to make progress with your healing no matter where you are located or if you don’t have the support of others. I can give you support and guidance that will greatly aid you in your healing journey—and if you can come in for hands-on sessions even more can be accomplished. My experience with sexual healing has fueled a purpose and passion to serve others on their journey from fear to freedom and in feeling empowered and whole again. I provide a sacred service for people in need of a trusted guide and coach to help them on their journey of healing. Much of the sexual healing counseling and coaching I do is through Skype, to anywhere in the world. For established clients, I also provide hands-on healing sessions. If you’re ready to be free from the fear of the monster and its devastation—and find yourself, empowered and whole again—contact me and let’s get started. To begin, visit my contact page. 15-minute free phone consultation available.